Gestational trophoblastic disease (GTD) can be broadly divided into two groups, hyda-tidiform moles, which represent abnormally formed placentas, and trophoblastic tumors, and tumor-like lesions. 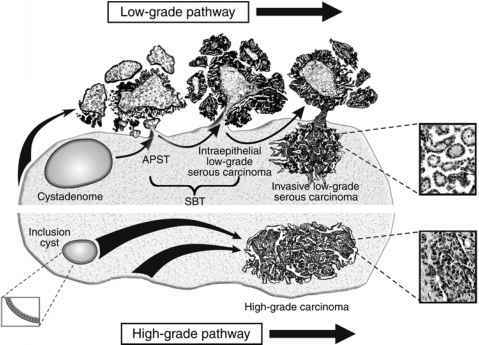 In contrast to hydatidiform moles, the pathogenesis of trophoblastic tumors and tumor-like lesions is largely unknown. In recent years, progress has been made in elucidating the biology of human trophoblast. The identification and characterization of the genes expressed in human trophoblast has led to a further understanding of the lineage and differentiation program of trophoblast and related this to trophoblastic lesions. It is now clear that trophoblastic lesions recapitulate the trophoblast present in the early developing placenta and implantation site. In this chapter, some of these recent observations will be summarized and correlated with the morphology and biology of human trophoblast in normal placentation and in trophoblastic disease.